I planted lettuce in flats August 19th during a week that temperatures remained in the 80s – perfect temps for lettuce germination. It was up in two days. The variety Winter Density, grew quickly to 1 inch and was transplanted to the garden before September 1st. (Fortunately, I managed to find find a small spot that had held a little moisture in spite of severe drought conditions.) The other varieties,Reine de Glace, Lollo Rosso, Little Gem and Baby red mix are “holding” in the flats while I wait for rain to water my beds. I recommend you continually try new varieties along with ones that are tried and true, since some lettuces do better in winter than spring and summer. After a few seasons of this you’ll know what are “must haves” for your fall/winter garden. Every once in a while I will plant a Mesclun mix to supplement, but I never depend on that for my lettuce. The original idea of Mesclun was to make available at one planting greens that appeal to every taste and texture sensation. Every mix can be a bit different so you may find one mix appealing and another not so appealing. The advantage to planting in August is—- assuming the weather cooperates and we get rain — that you’ll have numerous salads before the cold weather and less daylight slows the growing down to a snail’s pace. Keep in mind that during the winter there is insufficient sunlight to support vigorous growth. If you are able to plant your lettuce in August or even early September, this is the lettuce that will attain significant growth before winter and provide you with a good fall harvest. Even in winter you should get several nice salads. 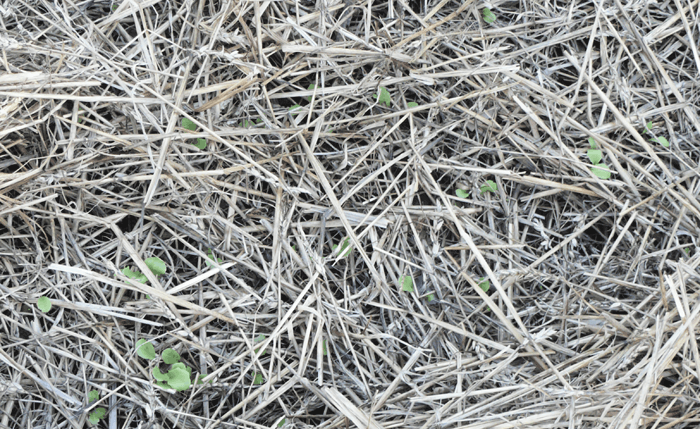 Try making it your habit to plant at intervals through at least the end of October. In any given year there are always so many variables and planting at various times increases the chances of having lettuce as many months as possible. If for some reason you lose your earlier plantings – which can happen some years – you’ll still have backup. 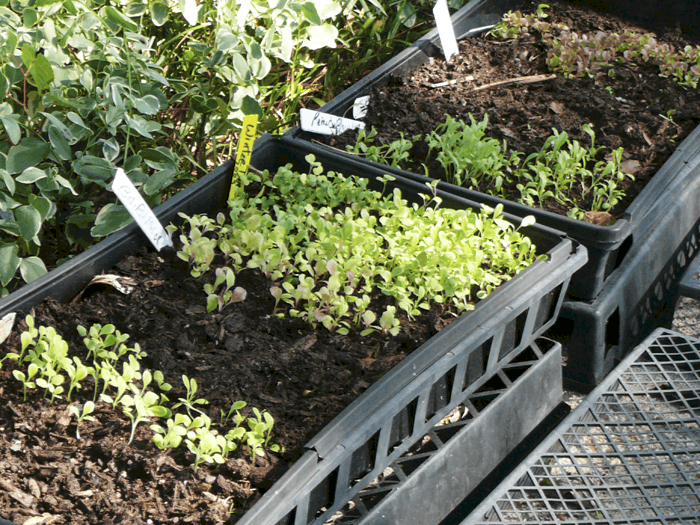 Even if it is started too late to make the most of the fall light and warmth for active growth, plants stunted by winter will transform beautifully in the early spring giving you a bounty of salad while you wait for the newly planted spring lettuce. 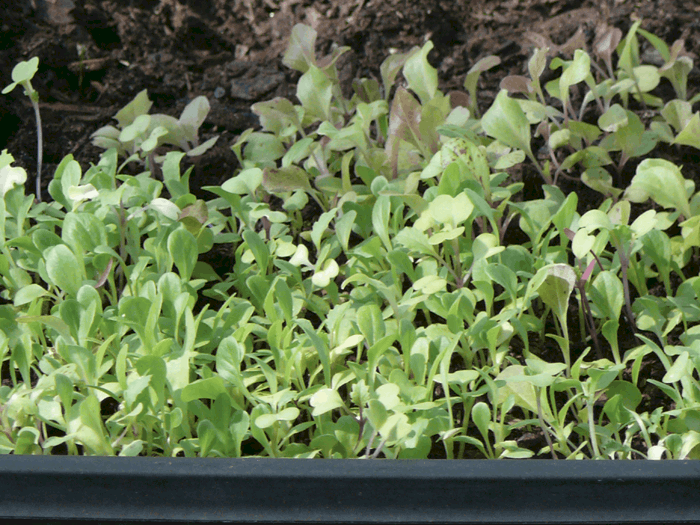 I always plant lettuce in flats mainly because I have found that I get excellent germination, but minimal germination when I direct seed into a garden bed. (I’ve heard some market growers who direct seed into beds also experience this.) If you have success with direct seeding lettuce, go for it! Flats also make it convenient to hold lettuce if conditions (like drought) are such that you can’t transplant right away. I’ve kept lettuce longer than 6 weeks this way. It’s not ideal to be sure, but it can be done in an dire situations. Using my finger to make the rows – a little trench 2 or 3 inches deep – I place the seedlings about two inches apart the entire length of the row. When I finish one row, I cover the roots of the seedlings and firm the soil around them. Then go on to the next row until you complete the bed. Lettuce shown below in a flat is the perfect size for transplanting. Mulch and water when finished. When you finish, “sprinkle” straw over the area by hand. The straw is loose but I put enough on that you can’t see the seedlings. Then I water them to settle the soil around the roots. As they grow they will have no problems finding their way through the straw. I do not water again unless we are in drought conditions and even then, I wait until the soil an inch or so down is totally dry. The lettuce shown below has been in the ground about 2 weeks. It is working its way up through the straw. I “sprinkled” more straw on after this picture was taken. I’ve heard fellow gardeners say pulling the seedlings apart is too much work. I plant small areas at a time and invest about 30 minutes each time I plant one of these areas. It takes effort, but its not hard at all. It really depends on how much lettuce you want and how badly you want it. Lettuce can take frost. When the temperatures are going to go below freezing you’ll need some type of protection to keep your lettuce at its best. The temperatures are going to drop. Nothing in place? If temps are going to drop and you have not yet prepared your cold frames, put a loose but rather thick layer of straw on top and that should protect from freezing. Take it off the next day and get busy getting your cold frames together. Also Remay fabric (or the like) might give you some protection from light freezes if you don’t have anything else in place. Another emergency stopgap you might want to try is filling plastic milk or water jugs with warm water (or let them heat up in the sun). Surround your plants with the jugs. They should give off enough heat to protect your lettuce. Cold frames don’t have to be fancy. For years (probably 15 years) I’ve used the same old windows put together in “A” shape. The glass has long ago fallen out or broken. I cover them with heavy plastic kept in place with heavy duty staples. The plastic needs to be replaced about every 3 years. Whatever you come up with remember the principle that everything needs air circulation. If you go against this principle you’ll have problems with disease, aphids and the like. When the weather is nice and above freezing, take the covers off. Put them back on at nights when the temperatures dip. If you have a particularly bad spell and have to leave them on for a week or so, take them off as soon as you can. Most of time there are plenty of “air leaks” at the base of my frames where they meet the ground. I like this because it provides additional ventilation, but will protect in temperatures from 30 to 32 if the wind is not severe. 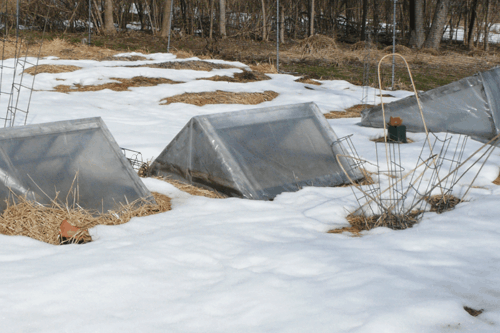 In case of severe cold, which is rare here, I will throw a few pitchforks of straw around the base of the cold frames to add the extra protection needed. Direct seed some spinach. (It doesn’t transplant well.) It does great in cold temperatures and the baby leaves will provide you with great salads in late winter and early spring. Anything you buy at the store can’t equal the taste and nutritional content of lettuce (or spinach) grown in your garden. With a little extra effort you can enjoy it in the fall, winter and early spring before your next lettuce crop is ready. Thanks much for all the great info on greens Theresa! If you ever get up near the Reading, PA area, come to Tully Lane and I’ll show you what I’ve been doing for the last 6-7 years gardening wise. Thanks Dennis. I appreciate the invite! Thank you for your advice! I am new to organic gardening, and have tried a small container garden this summer and thanks to your tips for late-season lettuce and spinach I look forward to healthy eating all winter. That’s wonderful Kim!! Keep up the good work and enjoy the fruit of your labor!